YERUSHALAYIM – 3000 km – "A call full of love for freedom for man. That we succeed in overcoming the (inner) fences in our dealings with one another and do not seek to find our inner stability behind fences of ideology", is the inscription on the Border Stone. The boundary stone first confirms positively the existence of boundaries. Without their recognition there is no encounter and no cooperation. Without a framework for living together, there is no freedom. Yerushalayim (English: Jerusalem, foundation of peace) can be read on the Border Stone at the outer border of the Garden of Freedom. The Hebrew name has been chosen as a reconciliatory avowal (Numbers 24:9) to a Jewish root of the European culture. Values from the Torah – such as the 10 commandments – became anchored in our European culture, through Christianity. They are values of freedom and life. The name Jerusalem has always been a metaphor for beauty, hope, and light. As the “Heavenly Jerusalem”, it is a call for a world in which people live together in peace, freedom, and dignity. The Holy of Jerusalem can only be preserved if there are boundaries. Their mindful recognition gives rise to a call for freedom. “Jerusalem is more than a location. Jerusalem is a condition of beauty. Jerusalem is everywhere where there is beauty. Now, some of this beauty is with you, in Bensheim; and Bensheim can therefore choose to be in Jerusalem as well. In order to get into the Jerusalem from above one has to go through the Jerusalem from below. Everyone would have the opportunity in Bensheim now… more” (Rabbi Andrew Steiman of Frankfurt on the Main for the inauguration). “Jerusalem” is more than just religious ideology; it denotes an idea of life. It is like the hope of waking up from a dark dream and find yourself in a world where people feel a closeness to each other and touch each other in all sincerity. This commences in the words that we speak. However, this proximity, in which everyone may bring their beauty, is not possible without healthy boundaries. Without them, we would lose ourselves. We first need to recognize these boundaries. They are to be respected. Boundaries (fences) can only be overcome in close cooperation, with mutual understanding. However, “overcoming” is not the same as “tearing down” or ignoring boundaries. Life is impossible without delimitation. We erect fences and devise borders to protect values and the diversity of ideas and structures. Matter itself is structure, thus demarcation. The more a culture approaches spiritual maturity, the more the healthy boundaries and values are realized in the inside, the more the external borders and fences can actually fall within this culture. A natural demarcation of this culture to the outside remains. A “heavenly Jerusalem on Earth” cannot be enforced by tearing down fences (boundaries). This idea is not about peace and humanity, but ideological blindness and recklessness about what fences protect. The results of it are even more conflict and war. “Yerushalayim, that we do not seek to find our inner stability behind fences of ideology." - is written on the (Jerusalem) Border Stone at the border of the Garden of Freedom by the European long-distance hiking trail. There is a peaceful way to overcome boundaries. This path can only begin with ourselves. The path of peace to the inside again led to the outside into a responsibility in the world. The current political events in Germany clearly illustrate how important it is that a healing of the cultural roots of the Germans can take place and how important it is to establish a culture of freedom. The local authority issued a special permit in 2012 for the construction of a paddock fence on the neighbouring property. Our monument shows the Tree of Life that breaks through a dark ring (for the dark past) towards Jerusalem and is thus a symbol of freedom. The new fence was to be built directly before the breakthrough of the Tree of Life. This counteracted the artistic message of the monument. It also meant that the originally planned memorial design with approved 33 large memorial stones lacked the freedom in order to be able to work in the intended way. A monument that feels overwhelming is not suitable for transporting a message of peace and freedom and attracting visitors. The artist removed 22 stones in the monument circle and replaced them symbolically in the sense of the artistic message of the monument design by a (Jerusalem) Stone at the border of the property. With that, he opened the "dark ring" of the monument to the other side facing away from the fence. These measures were able to bring a relieve to the overall appearance of the landscape again. On the Border Stone, the message of peace reads: "That we overcome the fences in cooperation...". In addition, with the design of embankments (angel wings) on the sides of the monument area and a levelling around the monument circle the fence got a different aesthetic function: from a blockade in front of the Tree of Life, the fence became part of a frame; a safe space for the Circle of Peace. That's how the Garden of Freedom first came into existence. With the Border Stone and the Garden of Freedom, the fence was successfully integrated into the monument design as a new, clearly visible border. It was an artistic response to the problem and it eventually led to a different much more developed design, both in terms of content and aesthetics. The design was thus created in a process of dealing with life. At the beginning of the year 2019, during an internet research, the artist came across the passage "Make a fence around the law / Torah" (Proverbs of the Fathers). Life itself has made this directive for the Jerusalem Friedensmal become a reality. But there was even more: It should turn out later that on the side facing away from the fence, towards which the monument had to be opened because of aesthetic reasons, formerly there was in the valley the "Jerusalem on the Rhine". The Border Stone is located by a hiking trail. The trail stands as a metaphor for the path of experience in life. The Border Stone shows the encounter with the world in a confrontation with the pain and suffering in life. At the same time, it symbolizes the hope that man must have on his way, not to give up because of disappointments, his own or others' failures, envy and lies, for not to give up because of a burden that is felt as overwhelming; for to be able to continue the way anyway. Yerushalayim is an expression of this hope. Man is not just a material being in a material world. What makes his essence is his consciousness. The path of man through his life can also become a spiritual process of awakening. Religions can be trailblazers and can give support in that with their structure, meaning demarcation and order. Religions become a problem when they no longer respect the individual's spiritual path, because they have become the walled-in and closed space of a religious ideology. The Catholic theologian Karl Rahner wrote about religion: "The pious of the future will be a 'mystic', one who has 'experienced' something or he will cease to be anything at all." Jerusalem is root and vision, woven into our culture, often injured in past and present. The freedom and abundance of life that we as humans and as a society desire cannot be realized without healing the deep wounds within our own souls and collective consciousness. Only then we will be free to more comprehensively understand the world and act responsibly today. “To learn from the past” means to turn a burden of the past into a blessing for the future. The unlabeled side of the Border Stone points towards the west, to the Hochstädten Valley, which contains numerous subterraneous tunnels as a result of the mining activities since 1865. Still, at the end of the 2nd World War it was envisioned to build up a weapons production at this place, protected from aerial strikes. Various displaced Greeks and concentration camp prisoners were used as forced laborers. The theme here is war and tyranny and our handling of this German past. This camp was operated as an external camp of the main Concentration Camp Natzweiler-Struthof in Alsace. The theme is thus also a system of main and external camps, which at the end of the war covered the whole of Europe and even included small towns such as Hochstädten. Here, you can find my essay of this history of the location substantiated with historical documents. The Border Stone reminds us in the context of a break in civilization as a commemorative stone, not to let us be captured by ideologies and to remember the values who let us speak of the Heavenly Jerusalem. The threshold underneath the Border Stone points to the Circle of Peace to the right of the Stone, with the inscription „Where dust is turned to light“. We know that we will never be satisfied living in a world that struggles in the shadows of ignorance and hate, knowing that life should be filled with beauty, truth, and good. Only where light is, the darkness can give way, which is why the Border Stone bears the inscription "Yerushalayim". The name represents hope for the world. The peace of Jerusalem is universal; it applies to all humans. Jerusalem could and should make people come together. 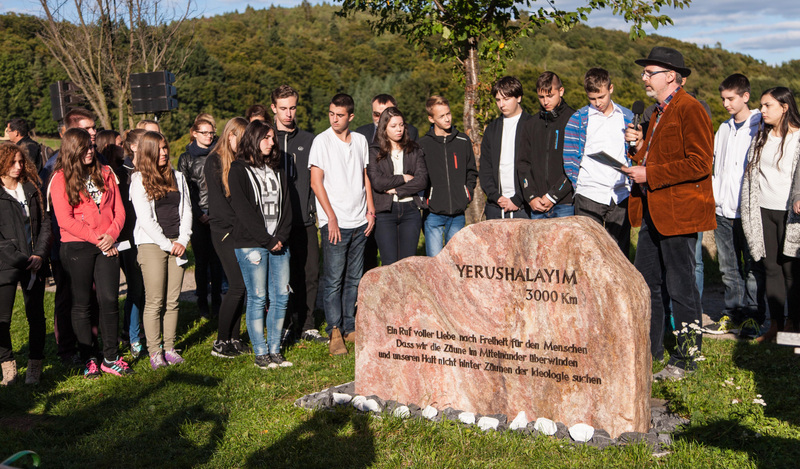 „You who are watching, who did not raise a murderer hand, but who did not shake off the dust from your yearning, who stood still, right there, where it is turned to light.“ The Jewish poet Nelly Sachs wrote these words in a poem after the Shoah. Monuments can be an encouragement to get involved for a world of peace and freedom and in that way to learn from the past. How can we take responsibility in the sense of Yerushalayim - the heavenly Jerusalem - in the world? Where does our responsibility begin? „Where dust is turned to light“ – this inscription on the ground in front of the Border Stone points towards the Tree of Life in the Circle of Peace. It shows the way to your own inner center: Peace and freedom begin in the own inner world.